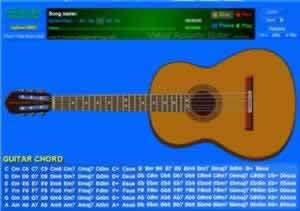 Virtual Acoustic Guitar online is to practice playingguitar on the internet. Music can be played by the guitar as a file (files.mid) upload to try to play the same. Can determine the speed of play. The training. Save the music you play as a file (files.mid) to play on your computer. Another simple way. In practice playing the Acoustic Guitar. Without a real guitar.To practice playing the guitar with a computer. For amateur musicians, amateur or a professional matter. Recorded song to play, press "Rec". Paul has finished playing, press "Stop". put a song name. and download song.